Bones and Paddington quickly make themselves at home wherever they are. Bones, on the left, is deaf, a trait that appears in Turkish Angoras. 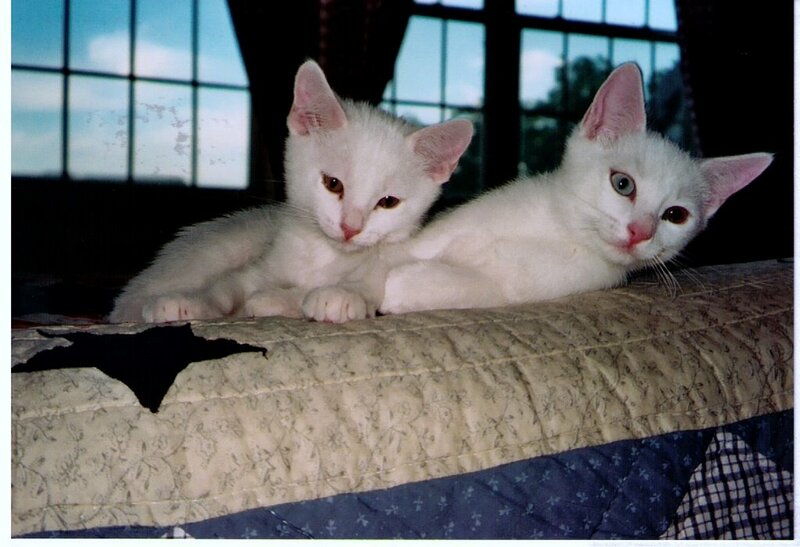 Paddington, on the right, has one blue and one amber eye, a frequent and even favored Turkish Angora characteristic. Turkish Angoras are known as the “swimming cats.” Bones loves standing in water in the sink. We parents do crazy things for our children. My husband and I volunteered to help our daughter move her belongings to a new apartment with two roommates while we visited her in Boston, where she attended college. Usually, we flew, but this time we were bringing some small pieces of furniture, a computer and housewares in our minivan from Kansas City — a round trip of about 3,000 miles. Our daughter gave us a list of what she needed. “Hmmm.” I didn’t know what a Turkish Angora kitten was, but how could that be important? “And they’re rare,” she continued. I sighed. Still not impressed. My daughter wasn’t going to be breeding and showing cats. Paddington and Bones find a warm spot on the dashboard to enjoy the drive to Boston from Kansas City. Here they are somewhere in upstate New York. On a break from classes, my daughter flew to Kansas City to get the kittens from Amber. When my daughter walked in the door of our house with one crying kitten clinging desperately to her shirt, she looked miserable. Motherhood can be hard. But the kittens quickly adjusted to their new temporary home. They didn’t mind being confined to a bedroom and bathroom area, because our old cat, Malcolm, didn’t much like them in his territory. Soon, the kittens discovered how much fun it was to pull all of the toilet paper from the roll and shred it. “We’ll keep the cats in a carrier,” I said, when my husband wondered whether it was safe to have kittens running loose in the car. Cat owner Amber emailed this photo to my daughter and her roommate. 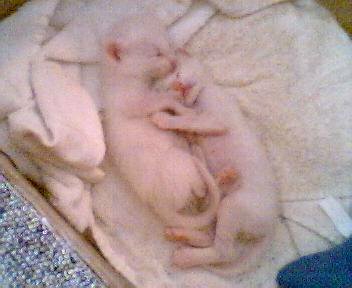 They were hooked when they saw the snuggling newborn brothers, which they immediately named Bones and Paddington. The brothers’ mother was rescued from a home of a woman who had more than forty cats. Confining the kittens lasted for about the first half-hour of the trip. The meowing was unbearable, so I released them. Once freed, they leapt and sailed around the minivan. 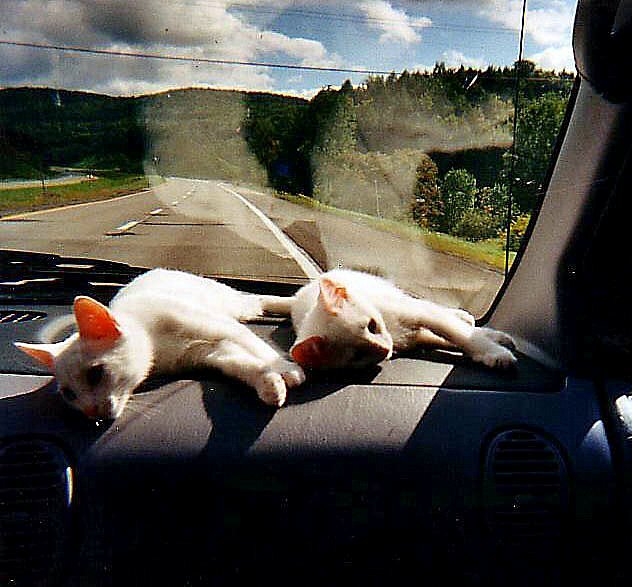 They watched from the windows and slept some times on the dashboard. Online, I’d found motels that would take cats, and the kittens were surprisingly quiet when we settled in each night. They snuggled next to us. We also spent some nights with friends along the way. With the kittens in the car, we stopped only for gas until we reached each night’s destination. We moved our daughter into her apartment in the Fenway Park area. (Another story.) There was hardly room for her and her two roommates to move around. The kittens quickly made themselves at home, climbing above the clutter. I missed our furry passengers on the drive back to Kansas City. To be continued. A few weeks ago when I was in the Emerald City, I was reading through Travel blogs. I saw this blog on the kittens and your familar face. Thanks for the welcome and adding me at right. You are right, blogging is addictive! I enjoyed both reads; it is quite similar to my tale regarding our little dog ‘Sweetie’. Eight years ago my daughter called me on the phone to ask which puppy she should choose; she was at a ‘market’ where young animals were on sale. She described one; my answer was ‘no’. She then described another saying it was a ginger colour. My answer to her: “The C.C. (Collective Consciousness) are saying yes to this one, though you will need to watch her food intake; it seems she has only little legs which won’t carry a lot of weight.” She bought the little bundle and within a year moved close to where I am now living. We looked after ‘Sabrina’ each time she had holidays; I would drive to her home each day to feed Sabrina and the lizards. One year though, they were going to the U.S. for 3 weeks; I wanted to bring Sabrina home so that she could be better looked after. Within 3 days my partner, K said he didn’t want her to leave; we had both fallen madly in love. The daughter was very pleased, saying her job meant she didn’t have time for Sabrina, and sadly agreed. So, she was ours (with an inbuilt sitter and ‘second owner’ when needed). Her name is now ‘Sweetie’ (Sabrina just didn’t suit) and she has been our little joy for almost 4 years…. Thanks, Carolyn! I’m glad Sweetie found a home with you. You are all blessed, plus you have a back-up when you need one. I would love to see some photos of Sweetie on your blog.